Located in a deep canyon near Lost Lake, Sunshine Rock is a 700-foot monolith that would rival famous Beacon Rock in the Columbia Gorge, were you to set them side-by-side. The two rocks might even look a bit like twins: both feature walls of distinctive columnar basalt, and rise to a broad, fluted crest. 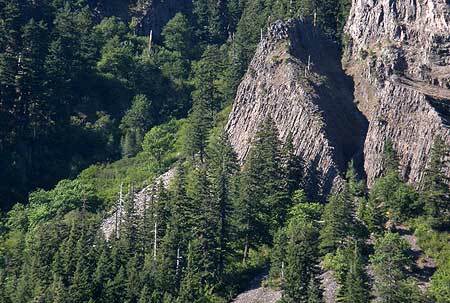 Despite its impressive size, Sunshine Rock is nearly hidden from view in the Lake Branch canyon, a few miles upstream from the West Fork Hood River. The rock briefly comes into view traveling down Lake Branch Road from Lost Lake, but only for a moment. With a little exploration, though, better views of this massive rock can be had from less-traveled routes in the area. 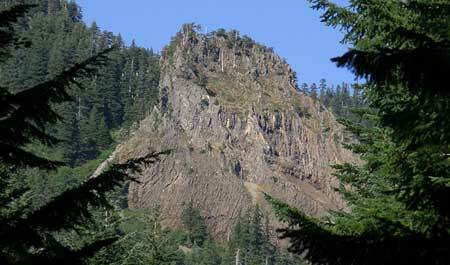 Sunshine Rock is a classic basalt plug — the solidified lava throat of an ancient volcano that was once a mountain. Geologic maps of the area identify the rock as andesitic basalt, dating back to the Miocene period of more than 7 million years ago. 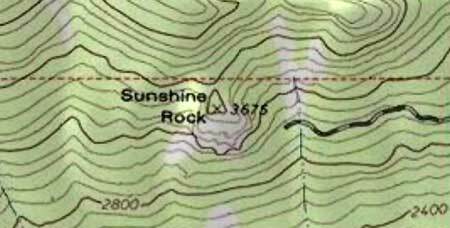 This means that Sunshine Rock was formed as part of the “Old Cascades”, the range or deeply eroded peaks and ridges that pre-date today’s relatively young big volcanoes, like Mount Hood, by millions of years. Over the millennia, the Old Cascades have been carved by erosion and folded by fault lines, with countless new volcanoes emerging to cover older peaks in successive layers. Like most of the rock from the Miocene area, Sunshine Rock was buried by huge shield volcanoes of the Pliocene era, which dates back 2-5 million years. Shield volcanoes are broad, gently sloped peaks that we now know as the mostly forested summits surrounding Mount Hood, including Larch Mountain, Lost Lake Butte, Mountain Defiance and several other volcanoes in the area. 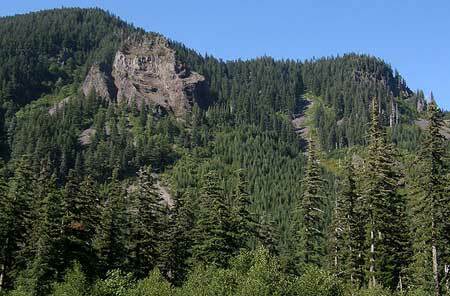 In the case of Sunshine Rock, nearby Indian Mountain is the overlying shield volcano that covers the older Miocene geology. In more recent geologic times, the U-shaped valley of the Lake Branch was excavated by 7-mile long glacier that stretched from near present-day Lost Lake to the West Fork valley. There, it joined an enormous, 1,000-foot thick mega-glacier that extended 17 miles from Mount Hood to what are now the apple orchards of Dee Flat, along the Lost Lake Road. The glacial period covers the Pleistocene era, which spans the most recent 2-million years, and numerous ice ages. The most recent ice advance peaked just 15,000 years ago, and was responsible for the most recent extent of the prehistoric Lake Branch glacier that exposed Sunshine Rock, along the flanks of the valley. Sunshine Rock seems to first appear in the modern record in early lookout tower survey photos. These photos were taken in the 1930s from new lookout sites, and include views from nearby Buck Peak, Raker Point and Lost Lake Butte. The view (below) from Raker Point in 1933 shows the rock most prominently, along with Indian Mountain in the background (another early lookout site). The venerable Oregon Geographic Names doesn’t list Sunshine Rock among its thousands of entries, so short of historical files kept by the U.S. Forest Service, the inspiration behind the name may be lost to history. The name doesn’t appear on maps until the 1950s, suggesting that it came into being after the logging era was well under way, in the post-war period. While the exact origin of the name is unknown, the thinking behind it seems evident: the position of the rock on a southeast facing valley wall allows it to catch morning sunlight, and thus would have been a bright beacon for nearby lookouts or loggers in the area. Forest Road 13 to Lost Lake forms a large loop, with Sunshine Rock located on the northern leg, along the Lake Branch Road segment of the loop. The best way to spot the rock is to approach from Lost Lake, winding down the Lake Branch valley, and watching for it through the trees. You can also get a close-up view from Road 1330, which intersects Forest Road 13 near the rock, and leads to an abandoned quarry directly opposite the rock. For more adventurous explorers, Road 1320 climbs nearly to the top of the rock, with old logging spurs leading to the base of its cliffs.